"A map is the most exciting thing in the world for me; when I see a map, I immediately feel restless, especially when it's of a country or a city where I've never been. I look at all the names and I want to know the things they refer to, the cities of a country, the streets of a city. When I look at a map, it turns into an allegory for the whole of life. The only thing that makes it bearable is to try to mark out a route, and follow it through the city or country. Stories do just that: they become your roads in a strange land, where but for them, you might go to thousands of places without ever arriving anywhere." In The American Friend, some shots of Jonathan Zimmerman's framing workshop show it to have a street sign on the wall above the placard "Gemülde/Rahmen". This can just be read as 'Kleiner Pinnas'. An online search found no street by this name in Hamburg. 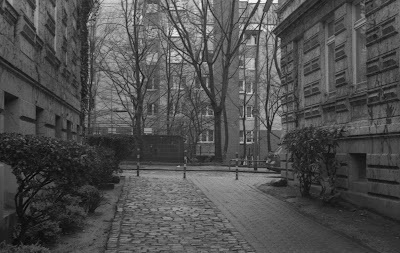 However, other shots in the film show the strreet which this joins, with the name 'Lange Strasse'. One feature of my research before leaving London was the availability of viewing maps online - and in some cases, using Google Street View when available, which it was in Wuppertal, but not Gelsenkirchen. On Google Maps, Lange Strasse is shown running parallel to a street named Pinnasberg, before turning to join it. There is an unnamed path - in grey - connecting the two before this turning. On Open Street Map this is shown as a footpath that cuts behind the houses from Lange Strasse to Pinnasberg. The street name where the framing workshop is clearly a diminutive derivative of Pinnasberg. 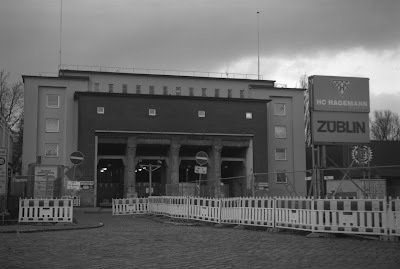 This part of Hamburg, St Pauli, has been transformed in the years since the film. The whole riverside and dock area has been subject to massive investment, and between St Pauli and the old centre of Hamburg is the huge Hafencity development, where islands of old warehouses have been replaced by modern offices and a new concert hall. Some of this investment has been spread along the dockside to St Pauli. In the film, shots of the Zimmermans' apartment, and the shop, show large areas of open, undeveloped land, often functioning as car parks. 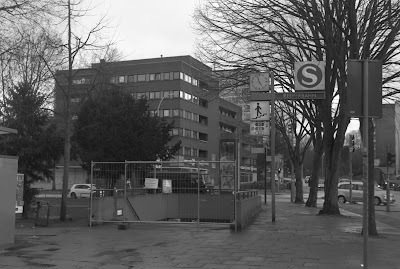 There is some preparation of the foundations for a block in Lange Strasse, a detail in the background, showing the beginning of the process of filling in these gaps. 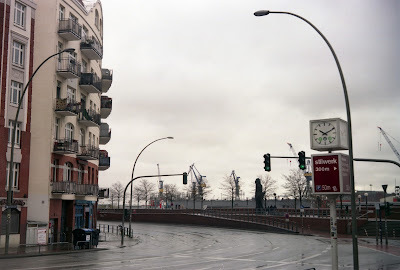 Arriving in St Pauli, the building used in the film for the apartment is easy to find, on the bend of St Pauli Fischmarkt, despite being blocked on Street View (something I have found to be common in my searches for the various locations in German cities). However, the blurred panels appeared to be the right shape and size, and the satellite imagery looked as though, from the roof, it might be the same building, which it was. Since the film, all the vacant plots around the apartment building have been filled with new blocks, and there has been a new dock wall built separating the road from the dockside; in the film, the ground in front of the apartment leads uninterrupted onto the dockside.This wall has presumably been built for flood defence purposes, and there are road signs referring to flooding in the area. 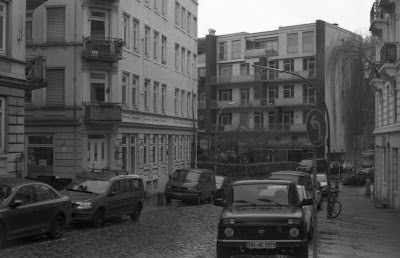 The road in front of the apartment is far busier than it is shown in the film. 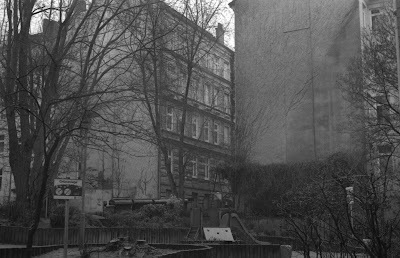 The buildings opposite the apartment with the graffiti are gone, and the view from the Zimmermans' apartment no longer has the sense of open space as it is shown to have in the film. Shots of Kleiner Pinnas in the film show it sloping away from the dockside, a straight perspective view used to good effect when lit from behind with the low winter sun shining on the cobbles. Finding Lange Strasse located just a couple of blocks behind St Pauli Fischmarkt (in the film there is no sense how close these are), I discovered why Kleiner Pinnas has disappeared from the map. As best shown on Open Street Map, where once this small road connected Pinnasberg and Lange Strasse, the space behind this two rows of apartment blocks is now a communal garden with a footpath, not straight, but with a serpentine route from street to street and the incline has been changed, steeper at one end, more level in the middle, behind the houses. There is a children's play area and what appear to be mature trees, though these must be less than forty years old, making it a little difficult to picture it as it looks in the film. At the Lange Strasse end, there is a sunken garage and its ramp fills most of the width of where the street once was, with the footpath running up one side. However, although the street sign for Kleiner Pinnas has gone, and with it an erasing of the identity of this small thoroughfare, the building it was on, Jonathan's framing shop, is still there. It is now a beauty parlour of some kind. After Jonathan's apartment and workshop, the other Hamburg locations of The American Friend are all easy to find, both in virtual terms and in Hamburg itself. 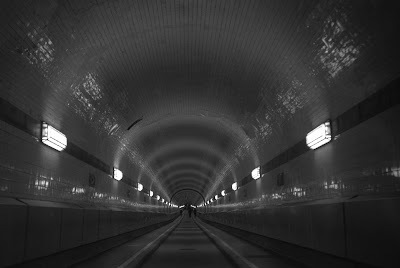 The St Pauli Elbtunnel which Johnathan runs through to and from his doctor still functions as a crossing for the Elbe. I descended into it after six in the evening when the lifts which take the cars from street level to the tunnel stop running. 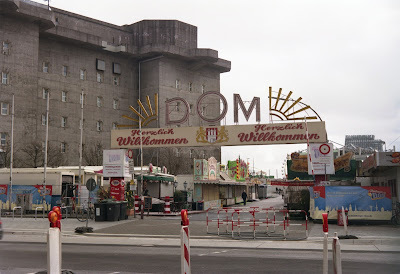 The Dom funfair, shown in a brief scene, takes place at Christmas and Easter; it was just opening when I arrived - the lights of the distinctive sign above the gate came on while I was taking photographs. What doesn't show in the film, as the scene takes place after dark, is the giant bulk of the Heiligengeistfeld Flakturm, which dominates views of the funfair. 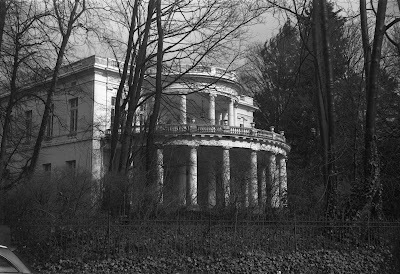 1817 von dem Baumeister Axel Bundsen fur den Hamburger-Russland-Kauffman und Reeder Wilhelm Brandt erichtes Landhaus, einer Villa auf der Krim nachempfunden. The American Friend isn't mentioned.